Public Key A unique number mathematically generated from a private key. A public key is like an account number that you use to receive bitcoins. It is created from your private key, which is like a password for that account number. How do you generate a public key? You use your private key (which is just a big random number) to generate a corresponding public key. You do elliptic curve multiplication using your private key, which will give you a final resting point on the elliptic curve. 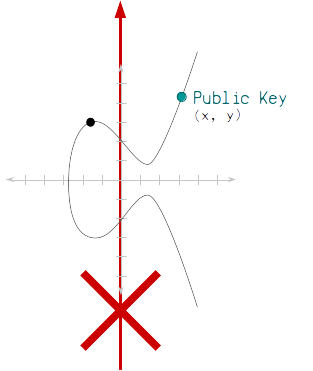 The x and y coordinate of this point is your public key. Why is the elliptic curve used? 1. It's not known how to work backwards to get the private key. You can go forwards using elliptic curve multiplication, but you cannot do mathematics to go backwards. 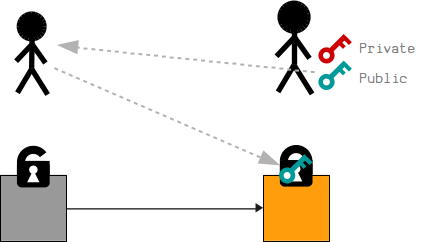 This means that there is a mathematical connection going from your private key to your public key, but nobody can use your public key to figure out what your private key is. Therefore you can give out your public key, but also keep your private key a secret. 2. You can prove that you have the private key without giving it away. 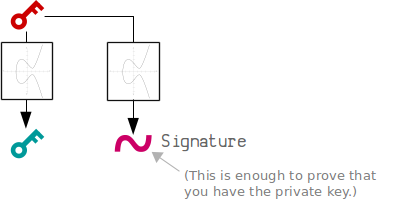 Basically, using some more elliptic curve mathematics, you can create a digital signature that proves that you have the corresponding private key for a public key, without ever having to give away your actual private key. It's like saying you have the password to an account, but you don't have to show anyone your actual password to prove it. This is thanks to the seeming magic of digital signatures, and it's all made possible through elliptic curve mathematics. 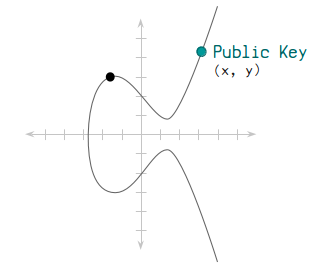 A public key is just the x and y co-ordinate of a point on the elliptic curve. It's usually stored in hexadecimal format. This is the old format. It has generally stopped being used in favor of the shorter compressed format. Bitcoin originally used both the x and y coordinate to store the public key. However, because the elliptic curve is symmetrical along its x-axis, each x coordinate will only ever have one of two possible y coordinates. If y is even, it corresponds to one of the points. If y is odd, it corresponds to the other. So in the compressed public key format, we just store the full x coordinate, along with a prefix that indicates whether the y is even or odd. We only need to store whether the y coordinate is even or odd. This compressed format ultimately allows us to work out the full x and y coordinates, but saves a lot of space on the blockchain (i.e. when we create transactions that lock outputs to specific public keys). How are public keys used in Bitcoin? You can give your public key away to people so that they can include it in the the locking script of an output when they create a transaction. Where can you find public keys inside the blockchain? If your looking through raw blockchain data, public keys can typically be found inside transaction data. 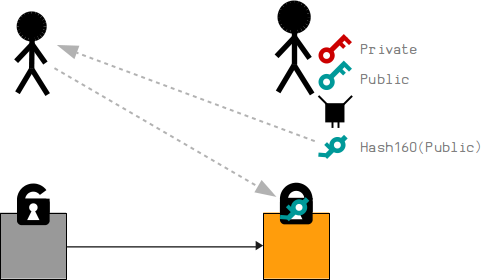 The Hash160 of a public key sits within the locking code (scriptPubKey) of an output. The original public key can be found inside the unlocking code (scriptSig) of the input. As you can see, the 04 at the start of the public key indicates that it's an uncompressed public key. This makes it almost twice as long as the compressed public keys typically used today. 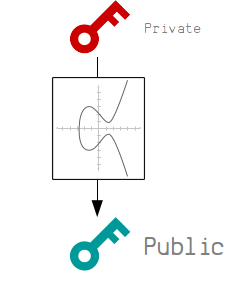 To create a public key, all you need is a private key and an elliptic curve library (available in most popular programming languages). # This private key is just an example. It should be much more secure! 15 Jun 2018: Minor edits.